I know what you’re thinking, d-limonene sounds like some kind of Frankenstein chemical created by the pharmaceutical industry. But actually it’s something much simpler and its extracted from a common fruit that we should eat every day, an orange. 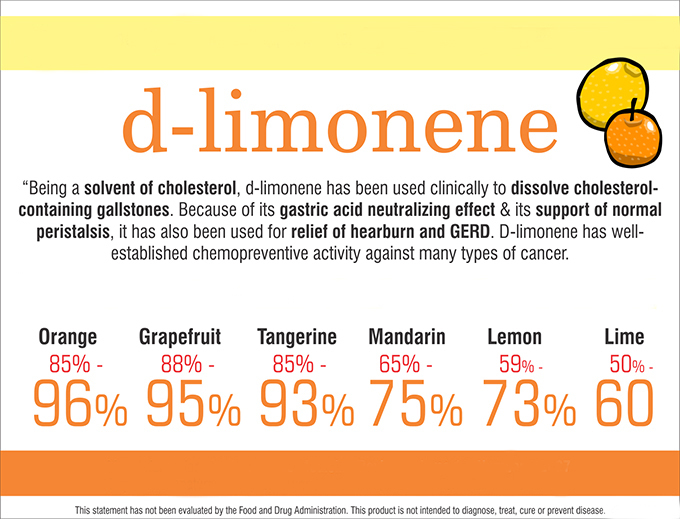 But the rabbit hole gets much deeper, d-limonene can also stop Gastric reflux in its tracks! The US National Library of Medicine has research articles stating the effectiveness of d-Limonene as a heartburn remedy. D-Limonene improves heartburn symptoms by apparently coating the lining of the esophagus and stomach, protecting them from the effects of gastric acid exposure. D-limonene also reduces fermentation in the stomach which helps to eliminate bloating and gastric pressure. On a final note by improving the stomach mucous lining D-limonene can promote the healing of ulcers. Studies have shown the daily intake of one 1000 mg capsule of d-limonene every other day for twenty days has reduced or eliminated GERD symptoms in most people for at least six months. Personally, I recommend using Jarrows D-Limonene which you can buy on Amazon.com or the Vitamin Shoppe for about $10, the Amazon testimonials of this product are impressive. Check out my d-limonene article on fighting cancer!